In this month’s edition of Marie Claire UK you get one of these two Elemis goodies for free. I love Elemis products. Elemis is a British brand that blends science with nature harmoniously to create effective but pure products. 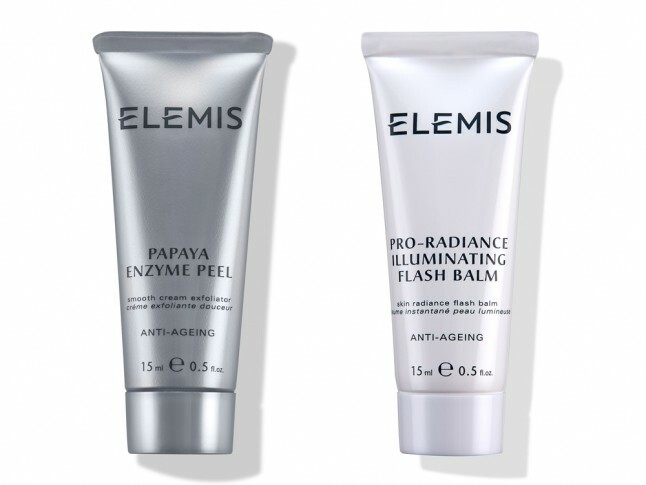 With Marie Claire you get either the Papaya Enzyme Peel or the Illuminating Flash Balm. I ran out of The Papaya Enzyme Peel a few months back and haven’t yet replaced it as I’ve been distracted with new things courtesy of my BirchBox and GlossyBox subscriptions but I’m so glad to see it with Marie Claire as it made me remember how much I loved it. Firstly, it smells divine and conjures up an image of tropical sunsets (always appreciated in damp and grey England). It is gentle but invigorating, pepping up the skin by kindly buffing the surface leaving behind clean, supple skin with a fresh-faced can-do attitude. I’m still using my first full-size Elemis Illuminating Flash Balm but I have to say that I can take it or leave it. It is pleasant enough to use and has a similar fresh and peppy approach to the skin but I’ve found I’ve used other products more, such as: Benefits Porefessional, Clinique’s Smart Custom Serum (reviewed in an earlier post), Liz Earle’s Skin Tonic, even Ultrasun’s 30 Face which is a sun screen acts as a pretty good pre-foundation perk-up. It can sometimes make my skin a little too pink and flushed but this is probably due to my Lupus and Sjogren’s sensitivities which can make me prone to blotches and redness. Elemis’ Pro-Collagen Marine Cream and Elemis’ Cleanisng Balm are in my first division of skincare essentials. Elemis’s Pro-Collagen Marine Cream is my summer moisturiser, it’s light, gel-like texture make ideal for summer skin unburdened by winter blights but its moisturising and anti-aging credentials mean that although light to touch still deliver powerful effects. I LOVE magazine freebies. I’m a sucker for anything free in the title especially when it’s a beauty freebie. 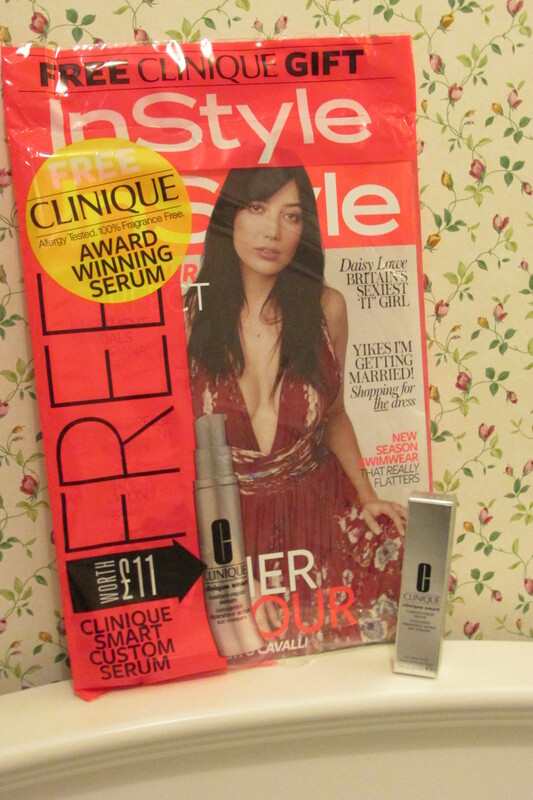 Not only is this month’s UK issue of In Style magazine giving away a beauty freebie but it’s a new launch beauty freebie – Clinique’s Smart Custom Repair Serum. I have been trialling the serum for over a week now. The product claims to ‘respond to skin’s individual needs. Visibly repairs lines and wrinkles, dark spots, uneven tone, firms, imparts radiance.’ There is not much written information regarding the product’s ingredients so I’ll just mention a few that are named on the box: grapefruit, mulberry, grape, barley and cucumber. I have to say I have never heard of barley being used before, does anyone know what it’s benefits are? 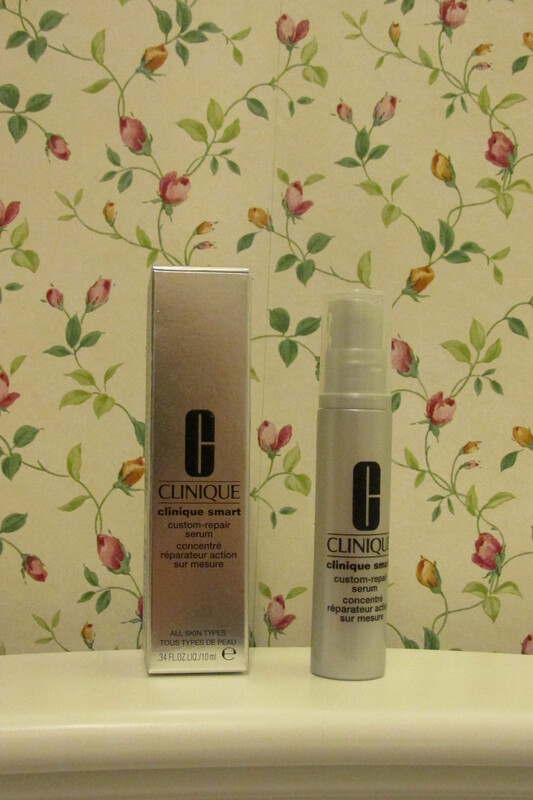 The sample is a generous size for a serum (10ml). It’s pretty costly in it’s full-size form the retail starting price is over £40. The serum’s texture is not like any other serum I know in that it’s thicker and creamier as most other serums are oil-based. It’s texture is similar to that of a primer such as Benefit’s Porefessional and I think the link between primers and this serum extends in the airbrushing effect that this serum has had on my skin. The serum has evened-out my skin-tone and redness and, most notably for me, reduced the look of my pores – just like a primer would. Except the serum is skincare not makeup, so the effects stay and improve over time. I’ve seen an improvement in tone and radiance over just seven days. As for its effects on wrinkles I confess that due to my age I’m probably not the best person to test that line of the product on. As those of you with chronic conditions may attest my skin will never be stable, even if I had all the creams in the world so I have learnt to build up an arsenal of skincare weaponry to fight any battle conditions. I have my rosehip oil for extreme dryness, my Liz Earle oil for calm, for example but if I can get over the price of this serum I would very much like to add it to my skin care arsenal to fight uneven terrain. N.B. On the box it says apply morning and night so it may be viable for some to forgo a primer and use this serum instead in the mornings.